Tacloban City gained international attention when it got savagely hit by Haiyan several years ago. Today, the city is bustling with life and energy. Indeed, you will not get bored with all things to do in Tacloban City that you will love! If ever you visit Tacloban, there are more to the city than meets the eye. And I am not just talking about strolling around the city and experiencing the local life. Tacloban City is the capital city of the province of Leyte in the Philippines. It is the gateway to all the lovely natural wonders in Region 7 and Region 8. The city is often overlooked by tourists who are wanting to explore the many beautiful islands in the region. Admittedly, people are more lured to gems like the Kalanggaman Island, Cuatro Islas, Canigao Island, Sambawan Island, Biri Island, Limasawa and a whole lot more. Who couldn’t blame them, right? Coming from someone who lived in the nearby town of Palo, I myself have never really thought of Tacloban City as a tourist spot before. It was pretty laidback and had a provincial feel to it. After Haiyan (locally known as Typhoon Yolanda) hit Tacloban and the nearby municipalities, the city has slowly risen up. Surprisingly, the devastation paved the way for new and better structures to be built. And more tourist-friendly destinations, I might add. Today, the city is bustling with activities that easily warrants a day or two exploration for anyone visiting the rest of Eastern Visayas. 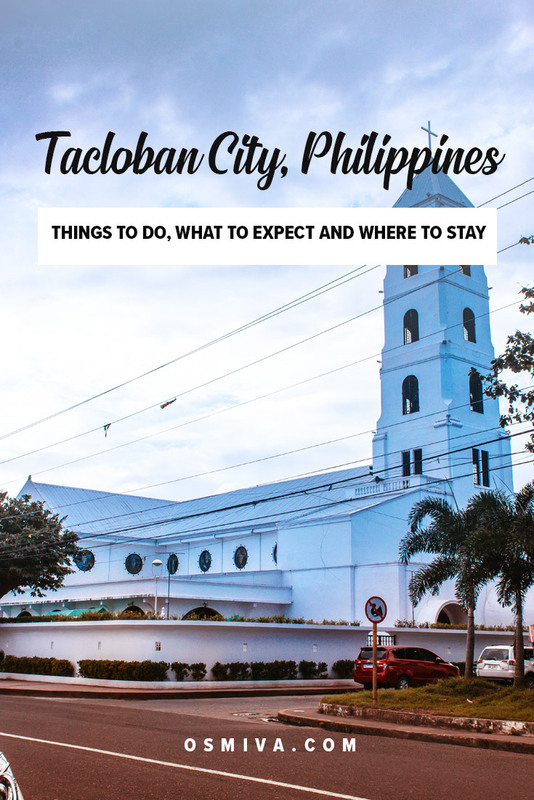 If you are headed to Eastern Visayas (Region 7 and 8) but will be stopping by in the city, here’s our recommended things to do in Tacloban City! Tacloban is located in Eastern Visayas, Philippines. Like I’ve mentioned above, it serves as the gateway to the region for people coming from other major cities in the country. The Daniel Z. Romualdez Airport is the only airport in the region with several commercial flights in and out Leyte. If you are coming from Manila, there are two (2) ways to get to the city. By Plane. As I’ve mentioned before, there are local commercial flights serving from NAIA to Tacloban City. Most are daily flights, but you can check the local airline websites for flight schedules as it may vary. Fare also varies depending on the date of the flight as well as the date of booking. Airlines usually have promo fares to watch out for. By Bus. Buses are also a favourite way of transport from Manila to Tacloban and vice versa. Frequency of trips also varies depending on the bus line and, of course, the weather. Land trips usually take 24 hours as the bus passes through Samar before reaching the city. If you are coming from Cebu, there are three (3) ways to get to the city. By Plane. Same with Manila, there are commercial flights going to and from Cebu. Via Ormoc. You can also take the ferry (fast craft or slow boat) from Cebu to Ormoc then take a bus or a van to take you to Tacloban City. Daily trips to Ormoc are available most of the time (except when there are gale warnings). So be sure to check out the weather bulletin. By Bus. There are buses from Cebu that also travel from the city to Tacloban via Bogo City in the northern part of Cebu. From there, the bus will take a ferry to Palompon then drive again to Tacloban. If you are coming from the rest of the provinces and cities in the Philippines, check out the available commercial flights to and from the city. Same with the buses and ferries too. Fortunately, after the Typhoon hit Tacloban years ago, the city’s landmark were restored years after. Some were even added to the list of Tacloban City’s tourists spots you can visit when in Tacloban. Here’s a list of things to do in Tacloban City for a day or two! While technically not in Tacloban, the MacArthur Park is a quick destination you can visit when in the city. It is located in Palo which is the municipality next to Tacloban and is famous for its historical significance in the region. The MacArthur Park or Leyte Landing Memorial Park is a recreation area in Palo, Leyte that commemorates the landing of General Douglas MacArthus in Leyte during World War II. 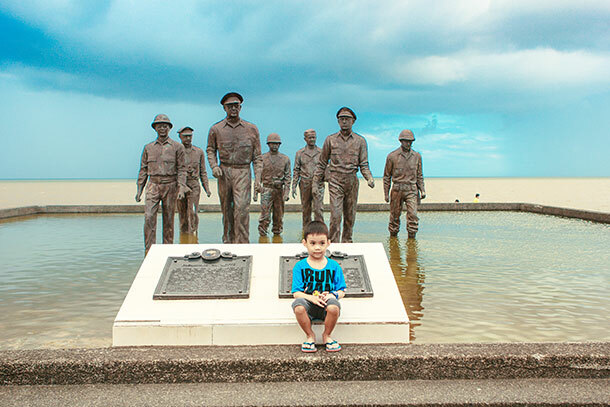 One of the highlights of the park are the large bronze statues of General MacArthur and his companions as they arrive at the Leyte Gulf and walking up the shore. For years, the park has been slowly deteriorating with little maintenance. Just recently, however, the park is being renovated. Something that we, the locals especially, are looking forward to seeing. How to Get Here: From Tacloban City, take the Jeep going to Baras, Palo. The jeep will pass by MacArthur Park. You may also ride jeepneys or multicabs going to Palo, Alang-Alang, Tanauan, Tolosa or Campetic. Alight at the Philippine Science Highschool – EV Campus or Leyte Academic Center. From there, take a tricycle to the Park. You might also like to check the route here if you wish to self-drive. 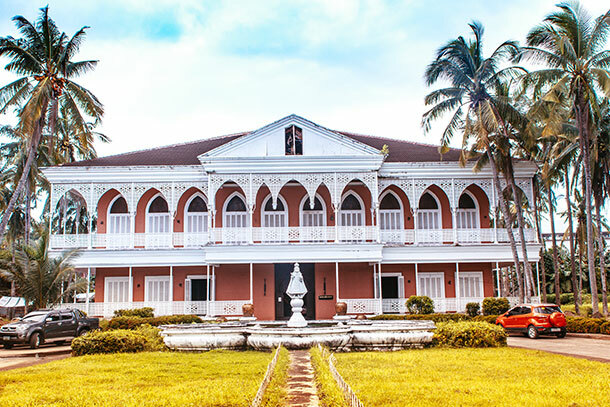 The Santo Niño Shrine and Heritage Museum is a museum that holds historical artefacts, antiques and artwork collection of one of the most controversial President in the Philippines. Politics aside though, the shrine is one of Tacloban City’s tourist spot that you should visit at least once. The shrine is built like a house with bedrooms, guest rooms, dining, receiving area and a grand ballroom. Upon entering, you’ll imagine people living here and enjoying the antiques and expensive pieces. However, that is not the case. The first family never lived there and the shrine was just set-up as a way to showcase and preserve collections from around the world. After paying the entrance fee, you’ll be assisted by one of the guides from the management. A 30-minute tour around the museum will be given with commentary on the furniture and the antiques being displayed on its origins. Personally, the Grand Ballroom with its impressive chandelier made such a great impression to me. And somehow, despite knowing that no one really lived there, you couldn’t help but imagine a family (first family or not) walking and enjoying the spaces a long time ago. Entrance Fee: 200 Php for the first 3 persons. Add 60 Php per extra person. How to Get Here: The Santo Niño Shrine and Heritage Museum is situated right along the road and is easily accessible if you ride jeepneys passing through Real Street. Just look at the sign at the front of the vehicle. If you are already within the city, simply take a tricycle and tell the driver to take you to the shrine. Another tourist destination in Tacloban is the Santo Niño de Tacloban. The church is one of the main churches in the city and is home to the Child Jesus: Sto. Niño. Sto. 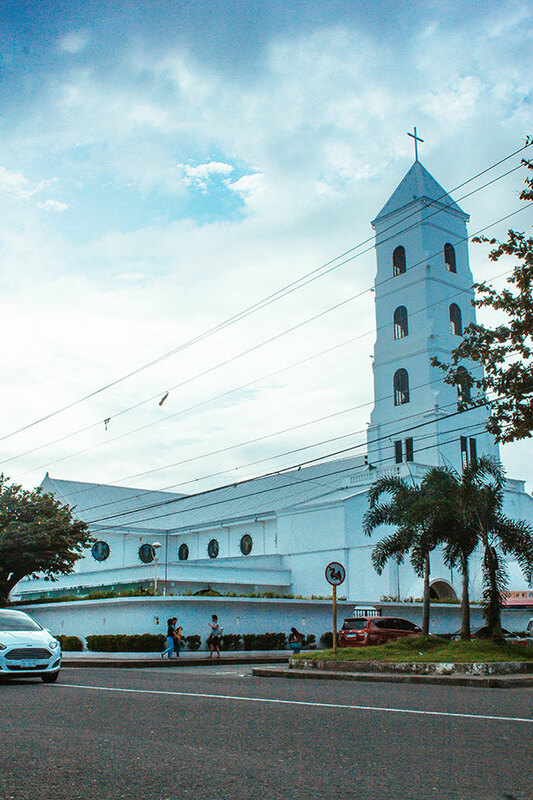 Niño Church is easily identifiable with its white facade and belfry of the main church. The church was hard-hit during the Typhoon Yolanda and was included during the storm surge. Today, you can’t help but be impressed by the renovations and improvement made in the church. Otherwise, just enjoy the church’s structure. How to Get Here: From any point in the city, take the jeepney passing through Real Street and Magsaysay Boulevard. You can easily inform the driver to drop you of near the church too. If you are already within the city, simply take a tricycle and tell the driver to take you to the church. 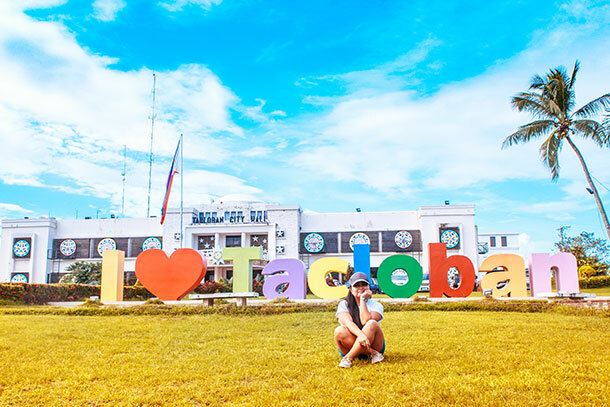 The ‘I love Tacloban’ signage is a recent add-on to the city’s tourist attractions. It certainly wasn’t there when we went home the year before. The colourful concrete serves a great backdrop for any photo session. Bonus point if you visit on a sunny day like we did. The sky complemented the bright colours of the sign. If you have the time, you can lounge around the grassy slope of Kanhuraw Hill (where the signage is located). But please take note that it is located fronting the Tacloban City Hall. You can also opt to ride a tricycle if you are already in Tacloban City. Just tell the driver where you are headed and you are good to go. 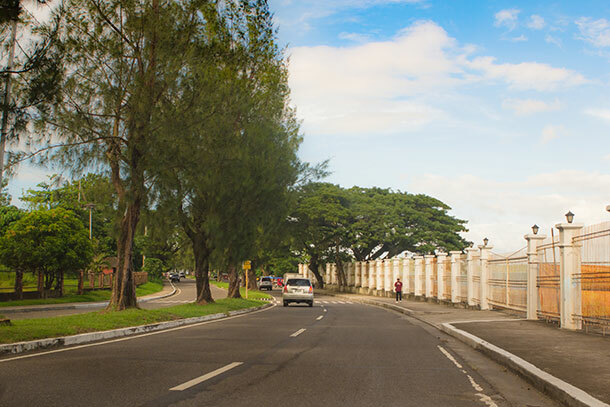 If you want a nice leisure walk along a tree-lined street with the smell of the ocean, then a stroll through the Magsaysay Boulevard is a good option. You’ll more than likely meet students walking here who are maybe headed to the Balyuan Amphitheater or Kanhuraw Hill. I remember strolling along the same street when I was in college with my friends. It certainly brought back fun memories when we were there with my husband late last year. How to Get Here: There are jeepneys that are passing through the area. Just look for those with the ‘Magsaysay’ on their signage. You can also hire a tricycle to take you if you are already in Tacloban. Here’s a closer look of the area for your reference. If you are a fan of historical structures, then this is the place for you. Standing proudly facing the Cancabato Bay is the Leyte Provincial Capitol with its Neo-classical facade and bas relief sculpture. 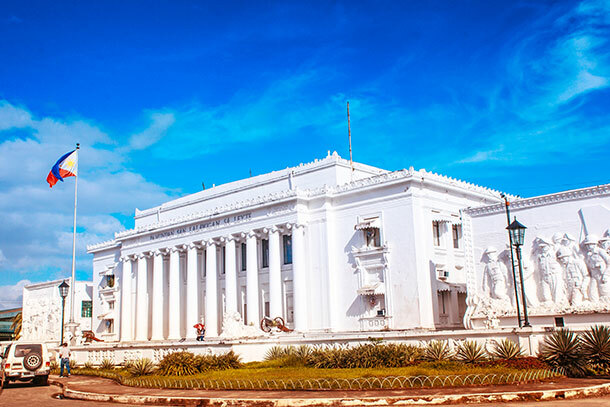 The Leyte Provincial Capitol is the seat of the provincial government in Leyte and shows bits and pieces of Leyte’s most historic moments. How to Get Here: To get here, take the jeepneys passing through Magsaysay Boulevard or opt to take the tricycle. 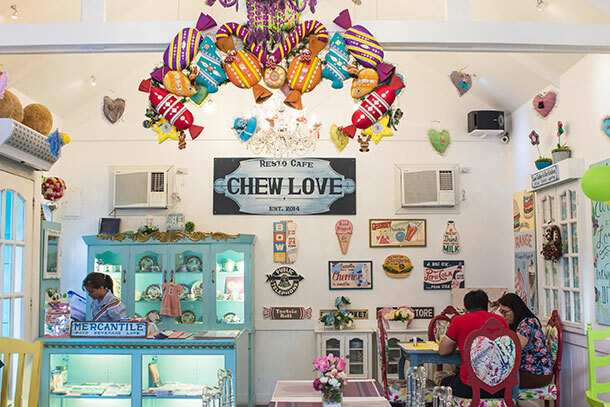 Before the devastation of the typhoon, several funky and inviting restaurants have emerged in the city. And even more so after the typhoon. I remember not really appreciating the restaurants in the city way back when I was still based there. Well, maybe I wasn’t that curious before as I am now. LOL. Anyways, after a few years, the food scene has become very interesting with several fun-themed restaurants slowly emerging in and around the city. Some of our favourites are the Ayo Cafe at the Apitong Road in the city and Chew Love in Downtown area. The restaurants I’ve mentioned above are pretty different from each other in terms of the interior but the food are both pretty tasty! Leyte has two (2) popular local delicacy that is certainly a must-try for people passing through the region. And these fantastic snacks can be found in Leyte’s capital city: Tacloban. The first delicacy is the ‘binagol’. 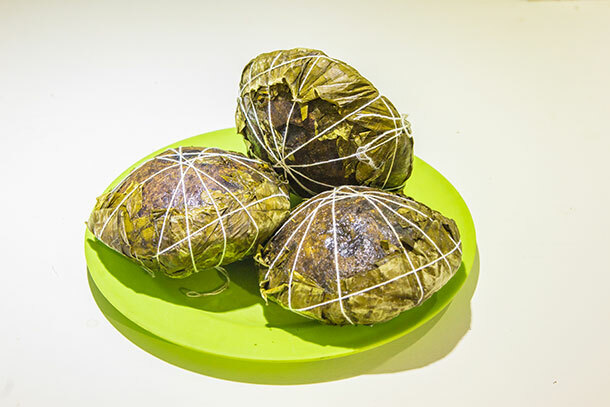 It is made from grated gabi or taro tubers and milk and are placed on a coconut shell and wrapped in banana leaves. Another favourite delicacy is the Chocolate Moron. 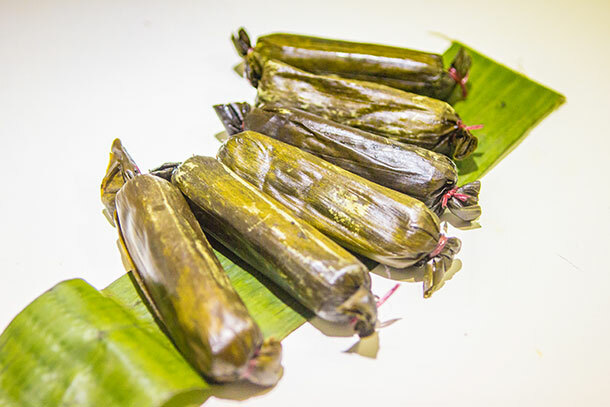 It is made from glutinous rice and coconut milk and wrapped in banana leaves. The binagol and chocolate moron are favourite native snacks and can be brought home as ‘pasalubong’. Though some may argue that you can buy some of these elsewhere in the country, Tacloban’s chocolate moron and binagol are worth tasting just to differentiate the taste. Trust me! Cost: As per writing, binagol is at 3 pieces for 100 Php while chocolate moron is at 80 Php per 1 dozen. Where to Buy: There are many stalls along Justice Romualdez Street and Zamora Street that are selling the delicacies. Our favourite is a stall at Zamora Street, fronting the Jolibee fast-food. 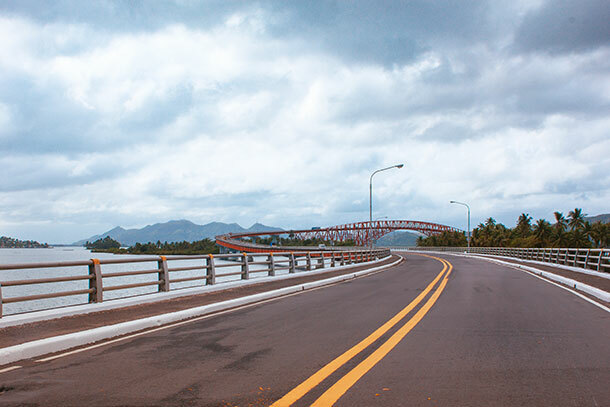 You wouldn’t truly be in Tacloban if you don’t visit the San Juanico Bridge. Geographically speaking it is no longer a part of Tacloban City, but it is a landmark that should be on your itinerary. The bridge is as iconic as it is controversial with a variety of stories surrounding why it was built and how it was built. Growing up, I would hear these stories and would be amazed about it. When you visit, you’d definitely see why people are making such a fuss about it. The structure itself is pretty impressive as it crosses the San Juanico Strait, connecting Ley-Sam (Leyte and Samar). The view is pretty scenic especially during the golden hour. If you look at it from above, the bridge forms the letters ‘L’ and ‘S’ for the provinces that it connects. If you are feeling up to it, you can walk all the way to the next island. At the centre, you can feel the bridge moving which can be very shocking for first-timers. LOL. How to Get Here: From Tacloban City New Bus Terminal, you can take the jeepneys and buses that are going to Sta. Rita or Basey. Tell the driver to drop you off at the bridge. During the rage of Typhoon Yolanda, big cargo ships anchored near the city were washed ashore, hitting structures and leaving dead bodies in its wake. One of those ships was the M/V Eva Jocelyn. 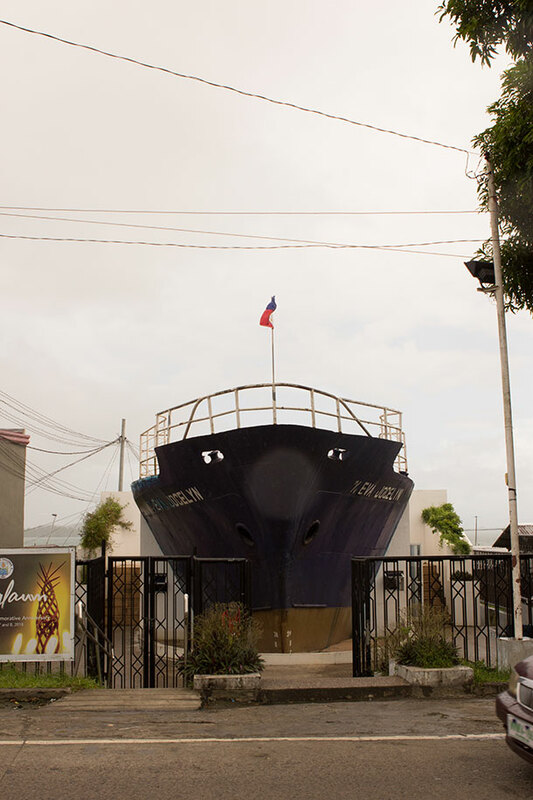 Ironically, the ship also became a refuge for some residents as it sheltered survivors during and after the typhoon. Today, the ship has been ripped apart leaving the Bow of the ship as a shrine to those who have died during the Typhoon. You can take a photo at the Deck of the ship and maybe say a little prayer to the victims. When we went there, it was raining so we never got a chance to go out and see it up close. Though based on my impression, the shrine is small and can easily be visited maybe in 5-10 minutes. My sister (who’s child was also a Yolanda survivor) wanted our nephew to get his picture taken up there. Unfortunately, the weather did not permit us. How to Get Here: You can hire motorcycles to take you here if you are within Tacloban City. The city is small and can be easily toured within a day, especially if you are self-driving. If you are in Tacloban for, let’s say, a week, you can definitely other places near Tacloban like the Sohoton Cave in Basey or maybe go south to Limasawa Island, San Pablo Island or go north to Sambawan Island or Kalanggaman. If you are in-between trips, you can definitely spend a day just touring around the city. Here’s a sample itinerary for you and your travel companions! Over the years, several new hotels have also opened in the city in response to its steady progress. Below are some of our recommended hotels for those who will be staying overnight or more. Z Pad Residences offer 30+ rooms for guests staying with family, couple or even solo traveler. Amenities includes Wi-fi and television among others. The hotel is also conveniently located near Real Street, making it accessible to public transportation in and around the city centre. Enjoy comfort and convenience when you stay at Hotel XYZ near Tacloban’s Downtown area. It is conveniently located that you can easily walk in and around the city centre. The hotel offers a total of 56 rooms with wi-fi, daily housekeeping and more. With a room selection of over 21 rooms, Ironwood Hotel is the perfect choice for travellers wanting to be conveniently located within the city’s centre and near easy access to public transportation as well. Amenities also include television and Wi-Fi among others. Tacloban City is located in Eastern Visayas, meaning you’ll likely to expect more rainy days than the rest of the Philippines. The region is commonly visited by Typhoons especially during Wet Season (June to December). 1. Bring an umbrella or cap with you when you tour around the city. The weather can be unpredictable. 2. Stay hydrated and bring lots of drinking water. 3. Don’t feel threatened when locals seem to shout or curse when they talk to you or to other people. It’s normal and ‘Warays’ do that when taking and that usually means they’re excited and enthusiastic. 4. Like most city’s, keep your valuables close to you when you go around the city. 5. Tricycles are the best and easiest way to go around the city. I remember typhoon Haiyan and the devastation it caused clearly. So pleased that this area has recovered so well. I imagine that visiting the memorial on the wrecked ship must be very moving. Tacloban seems to be a very interesting city which is certainly worth visiting. Yes it is.. Hope you can visit one day, Jane! Isn’t it interesting that we don’t think of our own towns or towns close to us as tourist places because they are familiar to us? I’m totally that way too! So fantastic to hear that Tacloban is running strong after the typhoon! MacArthur Park looks is really unique and I would definitely have to visit it! And restaurant hopping would definitely have to happen as I love Filipino food. My two closest friends from LA are both Filipino and they introduced me to it! However, I think my favorite is the I Heart Tacloban sign. I love it when there are colorful signs in towns and I try to find them everywhere I go! Your tips at the end are helpful-particularly about the shouting and the tricycles! Sometimes its good to have a easy-going, laid-back time and Tacloban city seems like a place just to do that. Taking pictures, going restaurant hopping and walking around is so pleasant. Yes, exactly 🙂 Thanks Punita! So many things to see and do here. I am fascinated by the Binagol and Chocolate Moron. I’ve never seen anything like it and it sounds absolutely delicious. I love anything that has coconut in it, so I’m sure this will be a treat I would enjoy. 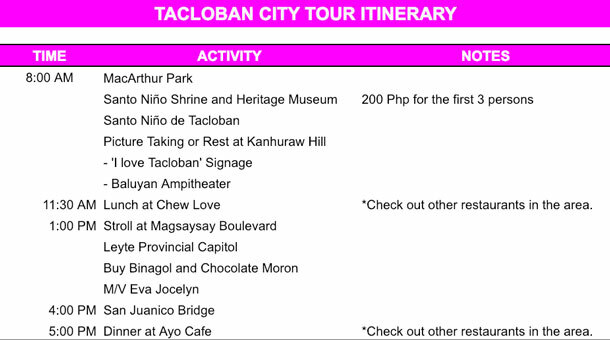 Wow so much to do in Tacloban City! Love the Juanico bridge and the variety of architecture and buildings. I see myself munching down on Binagol & moron chocolate haha. Cannot wait to visit the philippines one day! I enjoy seeing how a city devastated by Typhoon Yolanda is able to rebuild and draw people from around the world. It’s a great story of humanities resilience. I would enjoy seeing MacArthur Park. Also, I think visiting the M/V Eva Jocelyn to see the stories of destruction and salvation during the typhoon would be interesting. I enjoy seeing churches around the world, so would enjoy seeing the church and the beautiful white-walled Leyte Provincial Capitol. Tacloban city looks interesting to visit in the Philippines as it has many iconic heritage buildings and landmarks. I was not knowing this city before but thanks for sharing such an offbeat destination. Aww.. You’re welcome Yukti! Hope you can visit one day! Love how you have “discovered” a city so close to where you live as a wonderful place to visit for tourists. Tacloban does sound interesting and I have never turned down Filipino cuisine — love it. I would for sure want to visit MacArthur Park as I am a bit of a WWII nerd. I really need to visit the Philippines! Every time I read about it, I catch myself wondering when I am going to get there! Along with the lovely islands, Tacloban sounds like a great place to visit, see the sights and eat those amazing sweet desserts. So glad it has recovered and rebounded post-typhoon. thank you for this blog Ms. Marvi. Very nice and detailed. Do you know someone (tricycle driver probably) that we can hire for our visit to Tacloban coming March 23, 2019? We want to have a convenient and efficient tour as we will be travelling back to Manila on March 23 also. Thank you in advance. 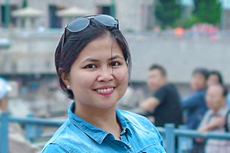 But if you’d really like an organized tour, my friend from Ludify Trips handled a Tacloban City Tour before. You can contact her through here page at https://www.facebook.com/LUDIFY.Trips/ 🙂 Hope this helps!